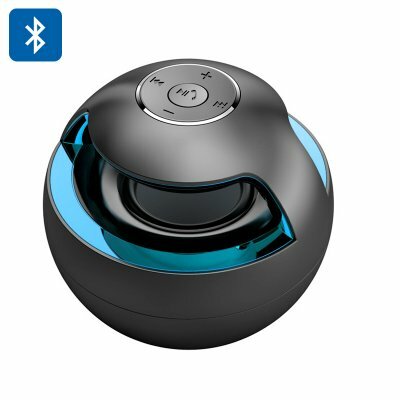 Successfully Added Portable Bluetooth Speaker “Magic Black Ball” - Stereo Sound, LED lights, Bluetooth 2.1 + EDR, 500mAh Battery (Black) to your Shopping Cart. Have the cool tunes fill your house with the portable Bluetooth speaker - “Magic Black Ball”. With high-end stereo sound and a custom LED light show – it’s just what you need to get the party started. Why just stream you music when you can make a light show out of it? This fun portable Bluetooth speaker comes with built-in LED lights and can complete your audio experience with cool visual effects. Simply connect it to your tablet or smartphone and play your favourite tracks. Thanks to Bluetooth 2.1 with enhanced data rate, your streaming will be fast and seamless. A great feature of this portable speaker is the support of an audio line in. This allows you to store play files directly on the speaker from a music player, in addition to streaming them from other devices. If you have any incoming calls, you can use the speaker to hold them hands free – a convenient option for when you are having one of those super busy days. Thanks to the 500mAh battery, you het up to 5 hours of continuous music playing time and easy charging through a USB. With a cool futuristic design and an enticing light show, the speaker is a must-have at any party or fun gathering. The Portable Bluetooth Speaker “Magic Black Ball” comes with a 12 months warranty, brought to you by the leader in electronic devices as well as Bluetooth speakers..